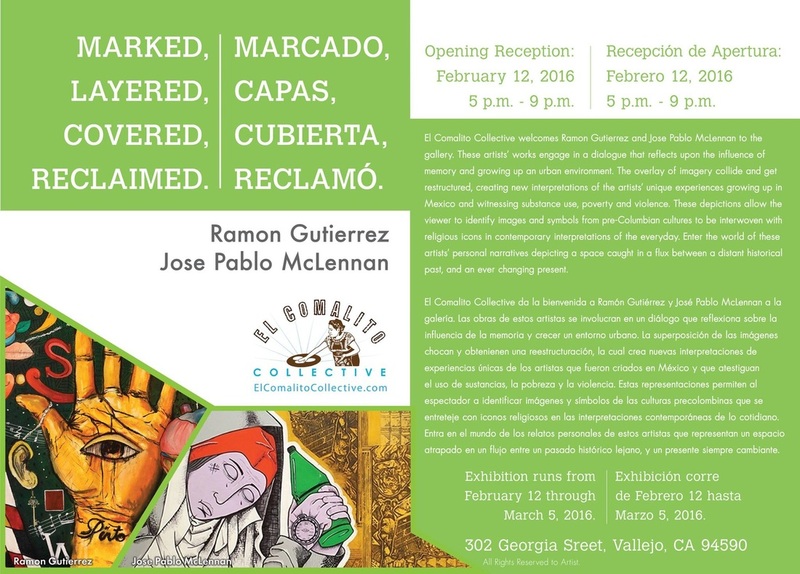 El Comalito Collective welcomes Ramon Gutierrez and Jose Pablo McLennan to the gallery. These artists’ works engage in a dialogue that reflects upon the influence of memory and growing up an urban environment. The overlay of imagery collide and get restructured, creating new interpretations of the artists’ unique experiences growing up in Mexico and witnessing substance use, poverty and violence. These depictions allow the viewer to identify images and symbols from pre-Columbian cultures to be interwoven with religious icons in contemporary interpretations of the everyday. Enter the world of these artists’ personal narratives depicting a space caught in a flux between a distant historical past, and an ever changing present. El Comalito Collective da la bienvenida a Ramón Gutiérrez y José Pablo McLennan a la galería. Las obras de estos artistas se involucran en un diálogo que reflexiona sobre la influencia de la memoria y crecer un entorno urbano. La superposición de las imágenes chocan y obtenienen una reestructuración, la cual crea nuevas interpretaciones de experiencias únicas de los artistas que fueron criados en México y que atestiguan el uso de sustancias, la pobreza y la violencia. Estas representaciones permiten al espectador a identificar imágenes y símbolos de las culturas precolombinas que se entreteje con iconos religiosos en las interpretaciones contemporáneas de lo cotidiano. Entra en el mundo de los relatos personales de estos artistas que representan un espacio atrapado en un flujo entre un pasado histórico lejano, y un presente siempre cambiante. I was born in the small town of Tehuitzingo, Puebla in Mexico. At the age of two my parents decided to take a chance and cross the border to come to the United States. They paid an unknown woman to transport me via airplane to Los Angeles while they arduously crossed the border by foot. A week passed before we were reunited in Los Angeles and from there we arrived to New York City. My parents, three sisters and I lived in the Bronx, Manhattan and Queens so we were exposed to the cultural conditions of many different immigrants groups in NYC. The visual resonance of the city forms part of the foundation for my global perspective. My artistic influences were the graffiti I saw on a day to day basis and the cultural iconography of Latino America. To put it simply making art is my passion. My art is an attempt to give rise to that which is spiritual, socially relevant, and sympathetic to the world that surrounds us. As humans we are compelled to share our first person narratives that illustrate parallels; blending together personal subconscious archetypes and cultural mythology. My art allows me to convey this type of narrative patchwork. With time and effort I hope that the visual and spiritual resonance of my art expands beyond the canvas creating positive energy in the world. Jose Pablo McLennan was born and raised in Atlixco, Puebla, Mexico. He received a BFA with an emphasis in painting from Sonoma State University in 2014 as well as a minor in Art History. He has lived in the Bay Area for the past 10 years and currently resides in Vallejo, CA. 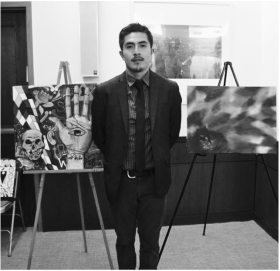 ​His artwork is created by combining his first artistic influences which were religious art he saw in churches, Mesoamerican cultures he learned about in school, and graffiti he saw in the streets while growing up in Mexico. The work speaks about the influence of his surroundings and the effect that the past has on the present. In his work he is critical of colonialism, hypocrisy and fanaticism, but also expresses an interest in syncretism in religion and culture. He continues to draw inspiration from his environment which has constantly been an urban one, thus compelling him to include subjects such as drug addiction, poverty and violence into his work.